Paysafe is a payment solution provider company that develops an extensive suite of payment solutions including software, credit and debit cards, online debit and credit, merchant accounts, and payment gateways. The solutions developed by Paysafe are getting popular among worldwide merchants; so far, more the half a million sale points in over 40 countries use a payment system developed by Paysafe. The payment solutions developed by Paysafe are fully compliant with both local and international payment safety regulations. Along with providing a faster alternative for payments, the Paysafe software also generates electronic financial reports that include currency conversation reports and cash flow statements. 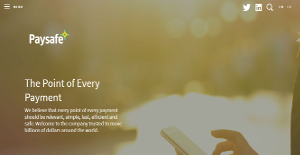 Using Paysafe payment solutions, individuals, as well as business, can send or receive money in multiple currencies. It provides a single platform for the users to manage all the payment procedures through a single channel. The Paysafe payment solutions are one of the safest are the safest online payment systems; complying with all the local and international payment safety and privacy protocols. Your client’s credit card data are tightly protected with Paysafe’s encryption and tokenization solution. For compliance, the software has a Risk Solution program that’s up-to-date and PCI-compliant. The web-based solutions that are also mobile friendly, allow the merchants to process their payments on the go. The users can select the currency types and payment modes according to the location of the receivers/senders. Paysafe also helps the merchants in multiple pricing, schedule management, and sending customized emails to their clients. When collecting payments, you can set up scheduled payment collections and customize the messages sent to your clients for personalization. Paysafe provides reports, business insights, and business tips for its users on a regular basis. This not only helps the company in maintaining better client relations but also helps the users in acquiring updated information on the latest industry trends. If you are interested in Paysafe it could also be sensible to analyze other subcategories of Best Payment Gateway gathered in our base of SaaS software reviews. It's important to keep in mind that almost no service in the Payment Gateway category is going to be a perfect solution able to match all the requirements of all business types, sizes and industries. It may be a good idea to read a few Paysafe reviews first as specific services may perform well exclusively in a very small set of applications or be prepared with a really specific type of industry in mind. Others can work with a goal of being easy and intuitive and therefore lack complex functionalities needed by more experienced users. You can also find software that focus on a wide group of users and give you a rich feature toolbox, however that usually comes at a more significant cost of such a solution. Make sure you're aware of your needs so that you choose a solution that provides exactly the features you search for. How Much Does Paysafe Cost? We realize that when you make a decision to buy Payment Gateway it’s important not only to see how experts evaluate it in their reviews, but also to find out if the real people and companies that buy it are actually satisfied with the product. That’s why we’ve created our behavior-based Customer Satisfaction Algorithm™ that gathers customer reviews, comments and Paysafe reviews across a wide range of social media sites. The data is then presented in an easy to digest form showing how many people had positive and negative experience with Paysafe. With that information at hand you should be equipped to make an informed buying decision that you won’t regret. What are Paysafe pricing details? What integrations are available for Paysafe? Pros: Never use this product, the company is cheat and they would charge you whatever they feel like. Cons: Everything with the company is bad and awful. Pros: There are no pros for this product. They charged for services not rendered. I had opened this account for a new business I had just recently started boarding and grooming pets. I was informed by salesperson that there were no monthly fees. They said they would be compensated out of individual transactions. I was slow to set up the credit system as just starting a new business and just moving I was overwhelmed but I didn't worry because I thought there was no charge to me regardless as was promised by salesperson. It is now a year later and I am sitting down to set up the credit card system. It turns out they were charging me over $22 per month for the past year pulling it directly out of my business bank account. When I phoned customer service they apologized but did nothing to refund the almost $300 they had taken from me. Cons: To only charge for actual services rendered. Never use this product, the company is cheat and they would charge you whatever they feel like. If you need more information about Paysafe or you simply have a question let us know what you need and we’ll forward your request directly to the vendor.